Another weekend in the books and only a few more to go in 2015. We are hastily creeping up on the New Year and I can't enough of this holiday season. Friday I left work and went to my doctor's appointment. It went OK. He asked me questions, felt my belly and said he didn't know if I tore my hernia or if I had torn scar tissue. He said both would be painful, but he was leaning towards scar tissue. He said he would need an ultrasound to confirm it and then make his decision. It feels a ton better now (lots of ibuprofen over the weekend), so I am thinking he was right. Not sure if I will get the ultrasound or not. Then I got my toes done and it felt amazing. But it was quickly squashed when my friend told me his grandson passed away Wednesday evening after being born Tuesday. I am so devastated for him and his family. My heart breaks and hurts for them. I can't and never want to imagine what they are going through. Prayers and love to them. I did a bit more Christmas shopping and scored some Crayola Bathtub Fingerpaint Soap for the girls. They LOVE bathtime, so I think they will really enjoy this. I also picked up a few toys using my Cartwheel app. Love that thing. I bought formula for hopefully the last time and grabbed coffee before getting stuck in major traffic. We went to an early dinner and called it an early night. Saturday we grabbed breakfast with our dear friends Nick and Nathalie (they got married in August) and the girls were so excited to see them. Then we headed out to do a bit more Christmas shopping and finally finished. Now to wrapping gifts and putting things together. So happy to be done and not venture out to the stores until after Christmas. That evening we went to the Nevada basketball game with the girls and then out to Mexican food. The Pack won and we celebrated with a margarita (the best kind of celebration). Sunday, the storm started to roll in, so we snuggled in. I did pick up some coffee for us since we had no milk or coffee at the house. I also ventured out later in the day to get groceries. But from there on out, we snuggled by the fire, watched football and made dinner. It didn't help that I was starting to feel under the weather. We bathed the girls, made dinner and then the girls went to bed. I went shortly after as my cold was in full force. Stuffy nose, headache and sore throat. Today I am feeling a bit better, but the storm left a mess on the roads. It was crazy driving into daycare and work today. Luckily, we made it in safely. And as promised, here is a picture of the girls with Santa. It is a picture of a picture (sorry), but I haven't had time to scan it in and needed to share it. See no tears, only smiles!! Bathtime fingerpaint soap?! That's amazing! Yes. I found it in the $1 section at Target. They can paint with it and it is soap. I tried finding it online after other bloggers mentioned it, but this is the only place I found it. Great little stocking stuffer. Me too! 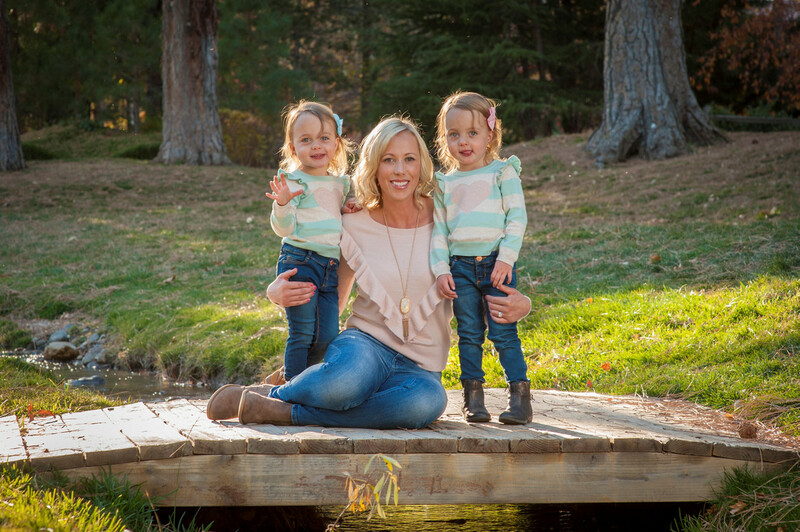 I thought we were going to get the screaming photo, but the girls were in a great mood. Probably helped that we went in the morning. Cannot believe we are closing in on the END of formula!! Crazy! It will be like getting a raise. I know, right? Formula costs a fortune when you have two drinking it at the same time. I am counting down the days. I remember when Cash came to the end of formula! Ahhh! What a relief! Your little ladies look adorable with Santa! It will be so much easier buying milk for them. And so much easier prepping their bottles daily. 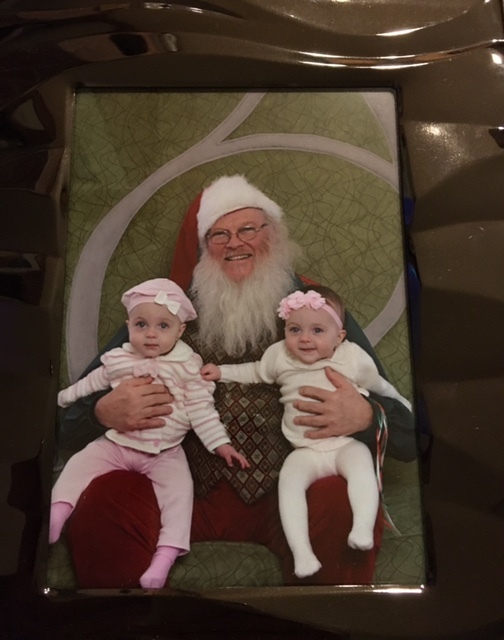 And thank you so much for the sweet comment on my girls with Santa. We lucked out this year. Ohhh, you like the Packers! I think maybe I've only read one other blog written by a Packers fan (though I know from your bio you like the 49ers best). My husband has always been a huge Packers fan so I became one by association. :) I agree, a margarita is the best way to celebrate. Your girls are SO cute. And I am obsessed with both of their names! Thank you for reading my bio!! And thank you for the sweet comments on my girls and their names. We searched long and hard to find those names.